40 sq. ft. per case. Case weight: 46 lbs. 5/16 in. Thickness x 2-1/4 in. Width x Random Length Planks up to 84 in. Revolutionary Rustics builds natural character into your space with the varying tones and textures of this one-of-a-kind solid hardwood flooring. A distressed hardwood born from timeworn beauty, the unique, double-stained surface treatments blend flawlessly to reveal colors with depth and dimension easily coordinating with any decor. 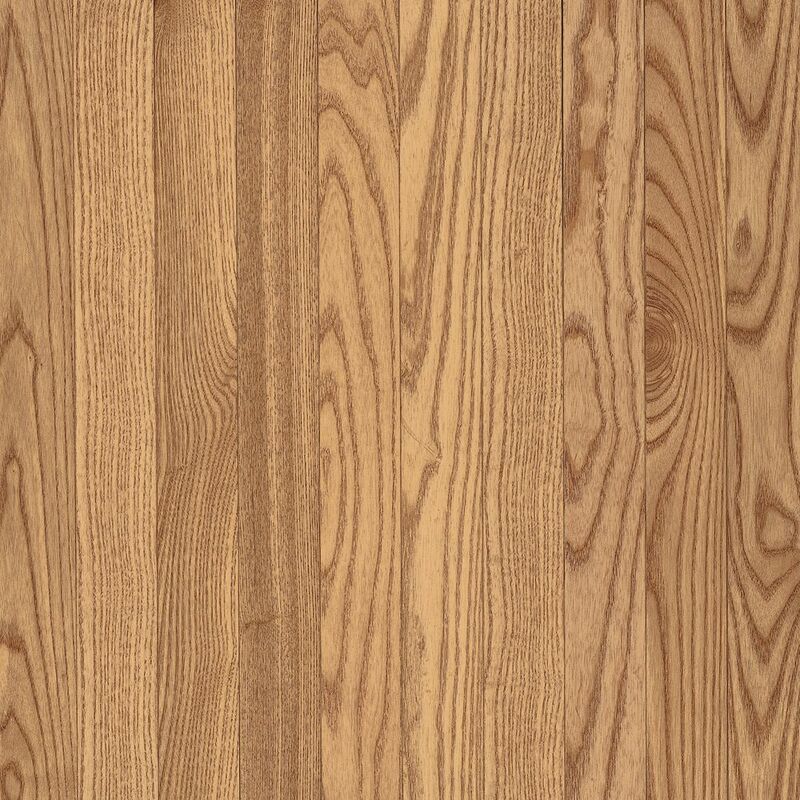 Enjoy the classic look of narrow strip, refreshed with an artisan stain effect. Constructed exclusively from 100% solid premium Appalachian hardwood, its organic beauty, strength and quality provide the durability needed to last a lifetime. And, with the protection of our Lifetime Finish and the assurance of a Limited Lifetime Warranty, you will love your floors for years to come. Add timeless style and value to your home with 3/4" x 3-1/4" Oak Saddle. Features thick solid oak, the most popular of hardwood species, known for its beauty and durability. The versatile design options of a 3-1/4 wide plank, smooth traditional, high gloss finish in a warm, sophisticated shade complimenting many colour palettes, will strike the right balance in any dicor. Micro-beveled edges highlight the distinctive grain pattern of each individual oak plank lending a customized look. AO Oak Natural 5/16-inch Thick x 2 1/4-inch W Hardwood Flooring (40 sq. ft. / case) is rated 4.5 out of 5 by 18. Rated 5 out of 5 by SS from The Bruce American Originals Natural Oak 5/16 x 2 1/4 worked great for my project. I was matching... The Bruce American Originals Natural Oak 5/16 x 2 1/4 worked great for my project. I was matching older oak flooring in a 1925 California Cottage/Bungalow. The flooring was installed in an addition with concrete slab. I installed waterproof membrane and 3/4 inch plywood subfloor. I used a pneumatic nailer/stapler with 1/4 wide x 3/4 long staples. Nailing in the groove was a bit tedious and would have been easier with a standard flooring nailer. The flooring material was delivered on time and in great condition. Great selection of lengths. Finished flooring looks great!!! I am an experienced builder with experience installing hardwood flooring. Rated 4 out of 5 by Mike from I installed this 5/16" oak floor over 10 years ago and we installed in a very busy country home w... I installed this 5/16" oak floor over 10 years ago and we installed in a very busy country home with 3 boys. It held up well for the money. had one spot under the kitchen island that wore down due to rough use of stools, but not that bad. I had a large gouge several years back and just put some urethane on it and it looked good, that's why this stuff is better that engineered floor because if you really scratch it bad it can be repaired. have not refinished it again but was told by local floor re-finishers it is possible 1 time only. This floor will look just like the 3/4" stuff when finished. just can't be refinished many times. Rated 3 out of 5 by handyman from Overall this floor is nice. You will definitely need to... Overall this floor is nice. You will definitely need to buy 10 percent more to account for broken tongues and groves and ugly boards. This way you can weed out the undesirable boards. Finish is nice. Rated 5 out of 5 by Roger from Product worked perfect! Needed to finish floor someone damaged, perfect... Product worked perfect! Needed to finish floor someone damaged, perfect match !! Rated 5 out of 5 by Luis from Perfect buying experience. Delivery to my apartment door. No problems!... Perfect buying experience. Delivery to my apartment door. No problems! Rated 5 out of 5 by Son from Beautiful hardwood floor. I love it!... Beautiful hardwood floor. I love it!